This crisis has ALREADY resulted in an historic loss of wealth — with more than $13 TRILLION of our collective net worth now GONE ! The reason for this crisis? In a word — CONFIDENCE — or rather, a dramatic loss of confidence and faith in our financial system. The consequences of this unprecedented economic and financial crisis will impact your investments for many years to come. And it is creating a sea change in the way we think about our spending, savings, investments and debt. 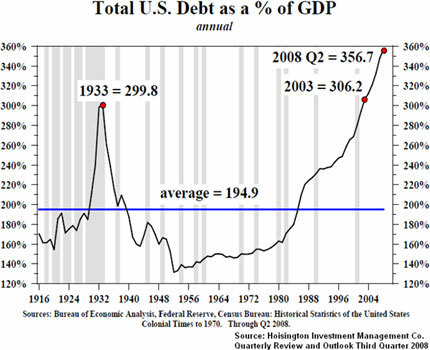 It could be several years before our economy rids itself of all the excess leverage, before bad debts are liquidated, and before a sustainable recovery can begin. Many of our clients have asked us not only for guidance in these trying times, but also for proactive investment strategies to help them preserve and defend their wealth in this turbulent climate. To help provide answers to these pressing questions, my colleagues and I at Weiss Capital Management recently hosted a special, online video briefing: Crisis, Consequences & Opportunities. In this exclusive Web video, we discuss our outlook for the economy and financial markets. PLUS, we talk about specific investment strategies you may want to consider now to take advantage of the opportunities we see ahead for investors. Sherri Daniels : Last year, investors faced the most turbulent financial market conditions of their lifetimes — indeed the worst market stress since the Great Depression. And in spite of all the taxpayer-funded bailouts, handouts and buyouts, this crisis continues to unfold in 2009, with TRILLIONS in additional losses possible. Ultimately, we could be facing multiple years of adversity before our economy rids itself of excess leverage, before bad debts are liquidated, before financial stability returns, and before sustainable, long-term economic recovery can begin. For many investors, this scenario is quite aptly a disaster — their retirement plans are drastically altered, or even postponed. Even savings accounts have suffered as interest rates have plunged. Americans have truly suffered a dramatic loss of wealth. In our special briefing today, we want to address the most burning questions we have received from many of our clients and other investors who come to us for guidance about what's in store for this year. Joining me to provide answers to these and other pressing questions are several key members of Weiss Capital Management's Investment Committee. Our first mission here is to help preserve your capital, even in the worst of times. Our second mission is to help it grow, even in a difficult market climate. Today, YOU get a unique chance to pull up a chair at our conference room table, and listen in as our investment committee members discuss the challenges and opportunities we see ahead. We will also focus on the professionally managed strategies our investment team is using NOW in our efforts to protect and grow your wealth. Now is the time for a thorough and objective review of EVERY single item in your portfolio — to make sure you're not sitting on any NEW hidden time bombs…AND …to help you avoid MISSING any major opportunities ahead. That's what we do for our clients each and every day. And finally, I want to offer YOU a special chance to follow-up with us personally — for a one-on-one portfolio review and consultation with Weiss Capital Management's professional investment staff, but first let's hear from our investment committee. So let's get started. Sebastian, you're the Chief Investment Officer and portfolio manager of our Weiss Bear Strategy, one of the few advisory programs we've seen that's designed specifically for making money in a declining stock or bond market. So let's tackle the question on everybody's mind right now: Is this bear market over? Sebastian Leburn: Well Sherri, as you know, that's a question that has been asked of us repeatedly of late — particularly since this bear market came unglued when Lehman Brothers was allowed to fail in September of last year…While we do not have a crystal ball and can't know for certain what the future will bring, our view is that we have NOT seen the ultimate lows in this current bear market. The primary reason for this position is that we do not expect the economy will recover meaningfully until sometime next year, thus equity markets will likely struggle for a while longer as economic conditions — particularly unemployment- continue to deteriorate. The big financial losses we've seen thus far reflect mostly the housing bust and mortgage meltdown of 2007 and 2008. But we have only just BEGUN to see the financial impact of the most recent phase of this crisis — the rapid contraction in the rest of the U.S. economy — and many others around the world. So, unfortunately, the ‘all clear' sign has not been given for the markets yet…there's still likely more work to do on the downside. That having been said, prices have already declined dramatically as you mentioned earlier. So the good news is that while markets may NOT have discounted ALL of the bad news to come, we are likely to witness a powerful bear-market advance this year — which may have already begun — as investors bet on a second half recovery, and hopes run high that the new administration in Washington will ‘fix' what ails us. Sherri Daniels : At the very least, that should provide a good opportunity for investors who have been looking for a rebound to raise cash and rebalance their holdings. Sebastian Leburn: Yes, but it also creates an opportunity to trade-up in quality, by switching into more defensive investments for the next phase of this cycle when many bargain buying opportunities may be found. In fact, we already see some of those opportunities on the horizon. The bottom line is this: Now is the time to carefully review your entire portfolio with an eye toward reducing your risk and making sure you're positioned to take advantage of the next opportunities. Sherri Daniels : I think that's good advice in a bull market. And it's especially true in a bear market like this one. Either way, you should be growing your wealth. But most people don't know how to do that in a bear market. Sebastian Leburn: We do. Our Weiss Bear Strategy performed very well last year — during the worst market since the Great Depression. This just goes to show you that wherever and whenever you find a crisis — you almost always find opportunities too. Sherri Daniels : In fact, the vast majority of our investment strategies outperformed their benchmarks in 2008. Sebastian, you said it before and I want to say it again: the key to taking advantage of new opportunities is first overhauling your current portfolio . You need to identify the stocks, bonds, mutual funds and other securities — that could be ticking time-bombs among your current holdings — perhaps jettison some and keep those with solid potential. Let's turn to you Steve Chapman , our Senior Vice President and portfolio manager of our mutual fund based programs. In 2007, global markets were star performers, but they were among the worst performers in 2008. Will they turn around in 2009? Steve Chapman: No, I don't think so. I've been watching these markets for four decades. I've been through recessions; bear market meltdowns and debt crises since the 1970s. But I've never seen anything quite like the chaos we've experienced in the last 12 months. What's making this one the granddaddy of them all is just the sheer size and scope of the problems. The entire globe is involved in this, one way or another. Sherri Daniels : So there is no place for investors to run and hide? Steve Chapman: In terms of geography, no. In terms of specific investments, yes. But you're right in this sense: The whole concept of decoupling —that foreign economies were not impacted by ours — is out the window, at least for now. You can't simply run to Europe or Asia and expect to find an easy escape. Sherri Daniels : So how do you approach this market right now? Steve Chapman: Here's the key: You DON'T need a bull market in traditional investments to capitalize on investment opportunities along the way — both on the downside and upside. All parts of the globe will experience periodic ups and downs during this market cycle and we have ways to make money in BOTH directions, whether up or down. 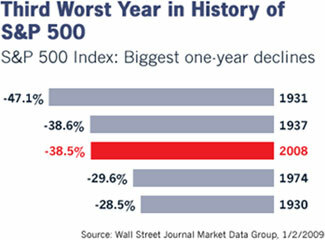 As Sebastian just said, we had one of the worst bear markets in history last year. But the Weiss Bear Strategy STILL performed very well last year. And when we see markets ready to rally, there are similar opportunities on the upside. That's the way bear markets work — big drops followed by big pops! Sherri Daniels : Mike is our Director of Research and Client Communications. He also writes our weekly e-newsletter, Weiss Advice . Mike, what's your take? Mike Burnick : A year or so ago, most people were complacent about portfolio check-ups. Washington and Wall Street denied we were even in a recession and most investors believed them. Now, FINALLY, ‘officialdom' admitted just last month that we're in recession — a full YEAR after the fact. Now, with Washington sending out the warnings, there's simply no more justification for complacency. The real-time indicators we follow at Weiss Capital Management told us MANY MONTHS AGO that we were in recession. 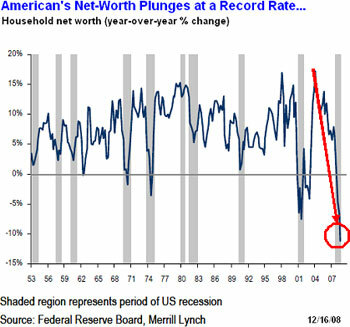 And now the risk is that investors may be complacent AGAIN, unprepared for how deep and prolonged this recession could be. Everything we see today, all of the indicators I watch most closely, tell me this is no garden-variety recession we're in — it's going to be much worse. It's likely to be THE MOST severe contraction anyone under 70 has ever lived through. Sherri Daniels : Many economists are starting to compare the current crisis to the Great Depression. What do you think? Mike Burnick : It's too soon to say if this is going to turn out to be as severe as the Depression. What we can say is that it will be DIFFERENT in many ways, but that won't make it any easier for the average person to cope with. As a result of this financial crisis, we're witnessing a sea change in the way the world economy operates. We're now in a period of asset DEFLATION, and de-leveraging — or debt pay-back. This carries major implications, not only for the economy, but for financial markets in the years ahead. Sherri Daniels : Dan, you are the sub advisor to the Weiss ETF strategies and you read the technical tea leaves of the market very closely. What's your expectation for the stock market short and longer term? Dan Ascani: We had what appears to be a panic low in the market last November. After that, stocks around the world began trending higher. By year end, we had seen an approximate 20% rebound. But the rally didn't hold for very long, and the market has sold off sharply since. This is the pattern I expect to see for some weeks to come. This volatility is tough for most investors. But it's precisely the kind of scenario I like for the ETF programs I manage. Sherri Daniels : Please explain why. Dan Ascani: Because my methodology is specifically DESIGNED to take ADVANTAGE of this volatility. I can buy ETFs that target the specific market sectors that are likely to outperform according to my trading model. I can also avoid ETFs that appear that they will underperform , and I can buy ETFs that are specifically designed to rise in value when the sectors or equity indices to which they're linked fall in value. This approach to investing in today's marketplace helps keep clients out of weak ETFs, such as banking and brokerages when those sectors are collapsing, and in ETFs that should outperform those sectors, in my view. And by moving a portion of the portfolio into inverse funds when market conditions warrant, clients have the potential to cushion the blow from declining markets — or even the potential to earn gains as these markets decline. So, to me it doesn't matter if “the bottom is in,” or the market is going to plunge to new lows. Overall, though, I AM skeptical of this market for the time being. Dan Ascani: I doubt we've seen THE ultimate bottom in this market. One BIG reason is that there is still a tremendous amount of uncertainty as to what remains to be done by the government in an attempt to “save” the economy. Recently, Citigroup needed another large capital infusion, as have many financial institutions in the past few months, and their dividend was cut from a yield of over 10% at the beginning of the year — to just a penny per share now. 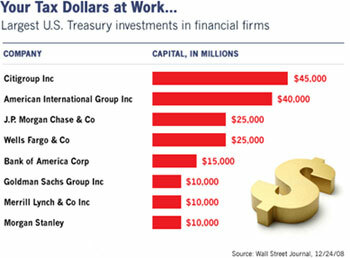 And Citigroup is STILL one of the most widely held stocks in America — many investors depended on this stock for dividend income. Not anymore — you probably don't want Citi in your portfolio now. As long as these kinds of extreme threats hang over the market, it's difficult to imagine cash on the sidelines rushing into stocks and bidding them higher. Sherri Daniels : Many people believe that it's a good move by the government to inject capital into the financial system, that it's the ONLY move the government could make to prevent a total collapse of the financial system. Dan Ascani: Yes, I agree with that. But I'm worried about how long the government will continue to take this sort of action, and how much the economy is ready to really benefit from massive government stimulus. It reminds me of the situation for many years in Japan, where the government infused massive amounts of capital, but to no avail, because the economy was in such a severe contraction that it wasn't able to absorb this capital and then put it to work. I'm worried about the same thing happening here to our economy. The first phase of the bear market that unfolded last year was all about the housing bust leading to the financial crisis — that fallout was centered on Wall Street. But now, we're just beginning to see the SECOND PHASE — the spillover to the REAL economy — hitting Main Street hard. Sherri Daniels : What happens next, in your view? Mike Burnick : A generational shift — a real SEA CHANGE in the way Americans think about their spending, savings, and debt. Households are spending a near-record amount of their after-tax income on interest and principal alone — to cover a MOUNTAIN of debt outstanding. Total debt is almost FOUR TIMES the size of our entire economy — equal to 350% of U.S. GDP — a record high — even more than during the Great Depression. Just like the banks, consumers are now de-leveraging — or shifting toward debt payback. That's a major secular shift in consumer attitudes and it's enormously DEFLATIONARY. Sherri Daniels : You haven't addressed one of my key questions: How long is this going to last? WHEN can we expect things to get better? 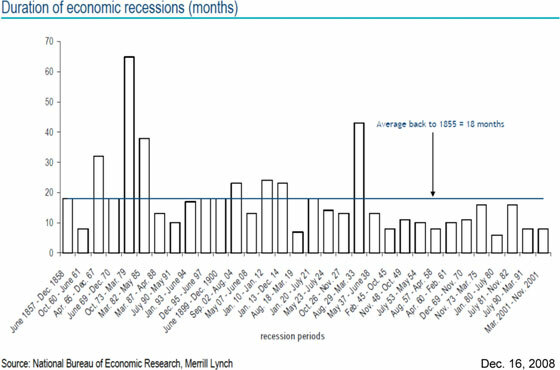 Mike Burnick : Recessions SINCE World War II lasted about 10 months on average. 6 And they were often mild. There were a couple of exceptions: the 1973-75 recession and the double-dip recession in the early 1980s — but by and large, MOST recessions of the last 50 years were relatively tame. Unfortunately, we got used to that — we were spoiled. Sherri Daniels : So you have to look back further in time, to BEFORE World War II. You hear a lot of comparisons to the Great Depression, but our economy is very different today. The difference today is that there are a number of automatic stabilizers, like unemployment insurance, FDIC deposit insurance and the like. And the government has certainly NOT been shy about slashing interest rates to ZERO and pumping money into the economy. Sherri Daniels : But those actions carry their own, unintended consequences as we're finding out. So like we said earlier, it's too soon to judge how bad it's going to be. Mike Burnick : Nor do we have to. It's already crystal clear that this recession is going to be worse than many expect or are even prepared for. We're already in our 13th month of recession, but those who think we'll be back to growth as usual by mid-year are just kidding themselves, in my opinion. Sherri Daniels : Sebastian, earlier you mentioned that we've been locked in a secular bear market, but there are still profit opportunities to be found along the way. What our clients want to know is this: where are we NOW in the cycle, and how should I position myself to take advantage? Sebastian Leburn: The 1980s and 1990s was a long-term secular BULL market in stocks, fueled by steadily falling interest rates and inflation, accompanied by positive structural changes in the economy, which led to faster growth and steadily higher stock prices. Now here's where many investors make the mistake of getting caught in the wrong place at just the wrong time. Dan Ascani: Right, after the big gains in the '80s and '90s, investors began to EXPECT that stock returns would stay elevated forever. This became a near-universal belief in the late 1990s — just in time for the start of a SECULAR BEAR market in stocks, beginning when the internet bubble burst in 2000. Sebastian Leburn: Exactly, the S&P 500 lost about HALF its value in just three years from 2000-2002. And tech stocks, the most overvalued sector at that time, suffered even more — down about 80% in value. 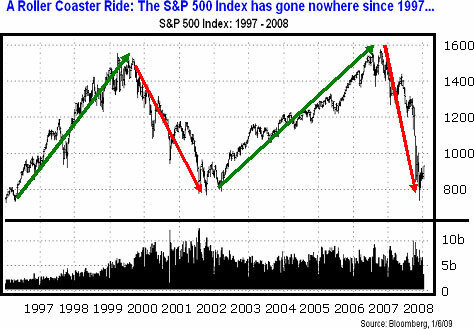 Stocks did reverse course and began to rise again in 2003. They moved higher for several years until the recent peak in October 2007, but here's the key point to understand, this was just a CYCLICAL bull market that happened within a longer term secular bear market — the game had changed — but I'm sure many investors missed it. Sherri Daniels : We discussed this long-term secular bear market starting in 2000 during our Bear Market Defense Forum last year. The S&P 500 topped-out in 2007 just 23 points above its previous peak in 2000 — that's it. 10 And if you adjust this small gain for inflation over the whole 8-year period between peaks — then stocks LOST value the entire time. Sherri Daniels : The market is right back where it started over 10 years ago, but for investors in the wrong stocks, often the most popular stocks — they've been hurt much more by this secular bear market. Sebastian Leburn: Right, and here's the key point: just because we're in a secular bear market, DOES NOT mean there won't be excellent opportunities along the way. You've just got to change your mindset from buy-and-hold, to be more nimble and opportunistic in your investments. Mike Burnick : Japan was the same story. The Nikkei has been in a devastating secular bear market since 1989 — 20 years ago — but there have been plenty of opportunities along the way. Sebastian Leburn: Right, so the opportunities are there, you've just get to watch the market trend closely and stay very nimble. The Weiss Bear Strategy is just one investment program we offer at WCM that aims to do just that. When stocks are plunging, we effectively sell-short the market using inverse mutual funds. And when bonds are plunging in price, we do the same with inverse Treasury bond funds. But getting back to your question more directly Sherri, for a typical investor, I suggest a straight forward asset allocation for the next several years. Your “hypothetical portfolio” should be defensive, but you should try to take advantage of today's depressed prices in a non-speculative way. You can do this by focusing on quality, and buying the RIGHT stocks at the right time, when they're on sale, like right now. And focus on DIVIDEND income in your portfolio, not just price appreciation alone. Dividends give you an ‘immediate' return on your investment. Sherri Daniels : How do you go about choosing the ‘RIGHT' stocks to own in this market? Sebastian Leburn: You start by doing your homework carefully, and building a diversified group of established, high-quality companies. Look first for strong balance-sheets that can weather this storm. As you can imagine, we are finding more and more of these outstanding values at today's prices. The dividend income these quality stocks provide is particularly attractive now: paying you much more than any money market. In fact, today, plenty of stocks pay more income than long-term government bonds. Sure, they may bounce around due to the overall market. But if you've done your homework, and they are good businesses, they tend to come back again; and usually stronger. In the meantime, you collect a NICE dividend while you wait. This is the approach I take in the Weiss Select Equity Portfolio, the stocks we own are great long-term values, in my opinion — and plenty of them pay you a dividend yield of 4%, 5%, even 7% or more. Right now, your “hypothetical portfolio” should also include a healthy allocation to government securities such as Treasury bills, notes and even bonds. Corporate bonds also look attractive, but again, QUALITY is the key. Lastly, a portfolio should have a healthy dose of cash, as high as 30 or even 40 percent at times. Strategies such as our Weiss Balanced program seek to replicate this type of “hypothetical portfolio” allocation with a mix of: high-quality, dividend-paying stocks, bond funds, and cash. The aim here is to provide you with more consistent returns — whether markets are going up, down, or sideways. Sherri Daniels : Dan, the ETF Sector Rotation strategies you manage for Weiss are also designed for an environment like this, where markets and sectors may see lots of moves both up and down — for months to come — without really going anywhere. Tell us how you see sector rotation strategies potentially profiting from such market volatility. Dan Ascani: All three of the Weiss ETF programs can potentially benefit for several reasons. First, NONE of the programs is dependent on a rising stock market. To the contrary, all three take some sort of defensive action when my quantitative (mathematical) model indicates that the domestic stock market is likely to trend downward. For example, the Weiss ETF Sector Rotation: Concentrated Program is based on my aggressive long/short trading program that employs a sector rotation strategy when my model indicates that the market is likely to rise, and buys inverse ETFs — those ETFs designed to rise in value when their underlying benchmark index falls in value — and raises cash when my model indicates that the market is likely to trend down. The quantitative model is important to all three programs because I use it to tell me when to become defensive. So in the second, more moderate program I manage, ETF Sector Rotation: Diversified, I can move to as high as 100% cash when the quant model is negative. When the model is positive, I buy up to eight or ten ETFs that are moving up in my rankings. And in the third program, ETF Strategic Allocation Portfolio, I use the model to help me decide when to reduce the portfolio's exposure to US and international ETFs, and when to increase the portfolio's weighting to fixed income ETFs and commodity ETFs. Finally, the ETF Strategic Allocation Portfolio is a core program designed to allocate investor capital between ETFs holding equities, fixed income, and commodities. So, it's not a program that is dependent entirely on stock market performance, and it diversifies most of its assets away from equities when my quant model is negative. Sherri Daniels : Steve, you manage some of our most popular mutual-fund based investment strategies, including fixed-income fund programs for conservative folks; and more aggressive strategies that cover global stock and bond markets, plus natural resources, gold, and even foreign currency funds. So here's a multi-part question for you: What's your outlook for global financial markets, natural resources, and the dollar in the year ahead? Steve Chapman: I believe this market has a ways to go lower before it's all over. We should be seeing a nice and potentially strong relief rally here shortly followed by another down leg as the Obama honeymoon wears off and it again becomes obvious that this is no ordinary, garden variety Bear market. It's going to take quite a while to cleanse this system of the excesses and leverage that's built up over the years. The financial blood-letting that began in 2007, was mainly at the institutional level — with big banks and brokers getting dragged down first — that was the 1st leg down. Ultimately, it will end at the individual level as the 2nd leg. As unemployment rises to surprising numbers, credit card and auto debt will subsequently hit the fan along with housing debt. Then the bottom will be in. This will prove to be a tough time for America as our reckless financial ways will do-in many consumers and businesses alike. But investors can still do well in this environment as market movements remain volatile with big swings in BOTH directions. It just takes skill and patience to capitalize on these opportunities. This market is NOT a good one for do-it-yourself investors as many of the finest money managers were humbled greatly last year — many posting enormous losses. The key will be using hedges effectively to make lemonade out of lemons with inverse funds, coupled with a prowess for timing the twists and turns in the markets. Today we are fortunate to have many tools at our disposal that were just not available in the business when I started out years ago. Here at Weiss we are quite familiar with them, and we're comfortable using specialty funds that can enhance your returns — in either direction. They can really help enhance your portfolio in a “trading” market like this. These specialty products, including leveraged and inverse funds, allow you to take advantage of volatility — both up and down — but of course you've really got to handle them with care! I use many of them regularly in all the programs I manage — both conservative and aggressive. I am very thankful to have them, but the key is to know exactly WHEN and HOW to use them. That's often the difference between success and failure in these markets. Sherri Daniels : Are these professional “hedging” techniques suitable for every investor you advise in your strategies? Steve Chapman: On their own, these leveraged and inverse funds can be very risky. Don't try this at home, as they say. But used as part of a well diversified strategy, they can “hedge” your portfolio against losses. In this case, they may actually REDUCE your risk overall. Of course it all depends on the individual investor, and your comfort level. We let our clients know that there are a number of these funds and ETFs available that are leveraged to the upside; and inverse funds that offer potential for gains even in a declining market. At Weiss, we're very familiar with all of these, but we're careful to use them sparingly in our portfolios. You've got to watch these funds very carefully as we do on a daily basis. Sherri Daniels : I know many investors are wondering about gold, oil and other commodities right now. They enjoyed a big rise for many years, then a spectacular fall last year. What's your outlook? Steve Chapman: Gold investors should be well rewarded as the Fed continues to debauch our currency, and stronger foreign currencies — and the securities denominated in such — should do well as the dollar slowly erodes over time, but not overnight. Oil and commodities and other REAL assets should enjoy a resurgence from their current oversold conditions as paper assets continue to falter and erode in value as people substitute real tangible assets for paper promise assets. Real assets like these should be included in most investor portfolios in the years ahead. Again, it goes back to getting a thorough portfolio review, so you make sure you're covered here. Dan Ascani: I agree Steve, holding tangible assets in your portfolio will be very important going forward. What's your take on interest rates Steve? Steve Chapman: I expect interest rates will remain low for some time yet, putting pressure on folks who depend on fixed incomes. Safety and liquidity will continue to be in fashion. But long-term Treasuries are in a danger-zone — they will be vulnerable as over issuance of bonds to finance all these government bail-outs eventually overwhelms price stability. Another area to proceed with caution is Muni bonds. I hear a number of experts talking them up right now, because yields are high — and they're tax free. The problem is municipalities across the U.S. face many years of tough sledding. First their tax revenues got hit by the real estate crunch; now they're getting hit again from the recession — so it's a double-whammy for Muni bond issuers. We're bound to see rising defaults. So again, you've got to know what you own. When a new client comes to me with a portfolio full of Muni's — or corporate bonds, or stocks, or funds for that matter — we go over each issue line by line on your statement. We evaluate each one case by case — before we advise you what to SELL immediately, what to HOLD, and only then do we go over what to BUY. I know it's a lot to think about, but that's where we come in! Sherri Daniels : Thanks Steve — you are so right — we can help many investors navigate through these treacherous waters with confidence this time as we did in the last bear market in 2000-2002. As you can see from the insights and analysis shared by our expert Investment Committee members today, there are a number of cross-currents set to make it another challenging year in 2009 and beyond. In this turbulent and uncertain environment, there's never been a better time to seek out the guidance of experienced investment professionals to help make sure your wealth is well protected, and that your investments stay on the right track. This is just a small sampling of what we do on a regular basis for clients who come to us with $250,000 or more to invest. Obviously, in this forum we can't provide you with individual, personalized investment advice or recommendations. That's because every investor is unique, with their own needs, financial goals and time horizon. At Weiss, we understand that one size DOES NOT fit all investors! But if you aren't sure what approach is best for you, our Financial Advisors are skilled at helping you determine the right mix of investments to suit your particular needs. We begin by sitting down with you — either in person if possible or over the phone — and together we review each and every single item in your portfolio. We'll examine every stock, every bond, every mutual fund or ETF in detail. After combing through your current holdings line-by-line, we will give you our thoughts on what to SELL IMMEDIATELY, what to HOLD for now — and most importantly — where to consider RE-INVESTING to take advantage of new opportunities that lie ahead. That's what we do for our clients every day, and that's what we can do for you. If you have a MINIMUM investment portfolio of $250,000 or more, and are concerned about your investments in this market, then we invite you to contact one of our experienced investment professionals for a complimentary portfolio review. In today's turbulent markets, I urge you to act now. Simply register for your free portfolio review using the link above, or contact a Weiss Capital Management Financial Advisor by calling: 1-800-814-3045 . We can provide you with fresh insights about your investments, and more details about the full spectrum of professional strategies we offer at Weiss Capital Management. Important Disclosures: The preceding edited transcript may contain forward-looking statements regarding intent and belief with regards to Weiss managed strategies and the market in general. Viewers are cautioned that actual results may differ materially from those statements. Information provided in this transcript is deemed to be reliable but not guaranteed to be accurate. Past performance is not indicative of future returns and, as with any investment program, it is possible to lose money by investing in the managed strategies mentioned. Before investing, please read the Firm's ADV Part II and all program materials. Dan Ascani , CEO of Ascani Wealth Management, serves as sub-advisor for the Weiss Capital Management ETF strategies. Dan is a Registered Representative of Kovack Securities, Inc., and a Registered Investment Advisor Representative of Kovack Advisors, Inc. Kovack Securities & Kovack Advisors are completely independent of Weiss Capital Management and therefore do not have in any capacity an affiliation or business involvement with the preceding presentation.